Can Chief Minister Fadnavis rein in his ideological colleagues to stop polarisation in the state? In less than 24 hours after January 1, Maharashtra’s Bhima Koregaon was transformed from a quiet village of historical significance mainly for Dalits into a national hashtag for all the wrong reasons. A momentous celebration by Dalits here had been turned into a conflagration claiming the life of Rahul Phatangale (28), injuring several people and leaving around 40 vehicles gutted. Its embers then touched major cities across Maharashtra including Mumbai, pitted caste groups against each other and threatened to widen the rips in the state’s social fabric. By Tuesday evening, the police in Pimpri, on the outskirts of Pune, had registered cases against two men with strong right-wing links, Manohar alias Sambhaji Bhide “Guruji” (85) who leads the Shiv Prathisthan and Milind Ekbote (60) who heads the radical Hindu outfit Samasta Hindu Aghadi. The Bhima Koregaon incident is the product of many entangled threads: consolidation among Dalits, competitive leadership among their leaders, the larger association between Dalits and Marathas, historical events and their symbolism in present times, the re-assertion of Dalit identity and mainstreaming of their history, the rise of competitive right-wing forces, and political mobilisation ahead of the 2019 national elections. Somewhere in this action-reaction cycle, selectively amplified by the political class and sections of the media, it is easy to confuse the chronology of events. The violence did not begin on January 2. 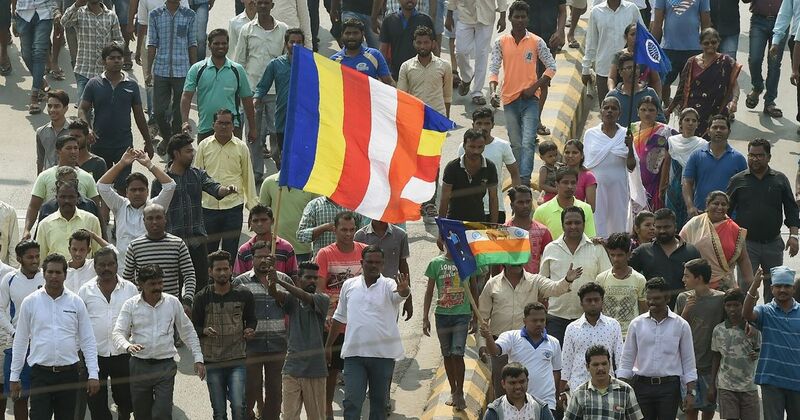 Enraged Dalits did not start the violence in Maharashtra’s cities, though the random acts of vandalism and muscle-flexing during the state-wide bandh on Wednesday have cost them the high moral ground there. It was they who faced the initial violence around Bhima Koregaon on January 1 and the attacks were rooted in a specific socio-historical context. Every January 1, Dalits, mainly Mahars, congregate at Bhima Koregaon to pay respects at the Vjiay Stambh, or victory memorial, there. It is an article of faith for them. On this day in 1818, a few hundred Mahar soldiers in the British Army are said to have managed to inflict damage and force a retreat from Koregaon of the forces of the Peshwas, a regime infamous for its brutal oppression of the lower castes. The term often used in these parts for that event is “Peshwai gadhli”: the Peshwa regime has been buried. In 1927, BR Ambedkar paid tribute here to Mahar soldiers on New Year’s Day, and the practice has continued every year since. On the 200th anniversary of the battle this year, several lakh Dalits were expected at Bhima-Koregaon. In fact, the celebrations began a day earlier with an event called the Elgar Parishad in Pune’s legendary Shaniwarwada, the seat of the erstwhile Peshwa empire. The organisers, the Bhima Koregaon Shourya Divas Abhiyan, invited Dalit activist-turned-MLA from Gujarat Jignesh Mevani, Radhika Vemula (whose son Rohith Vemula became a national figure after his suicide in 2016), and Delhi-based student leader Umar Khalid to participate. The very idea of Dalits taking over Shaniwarwada, if only for a few hours, was an affront to the descendants of the Peshwas and assorted Brahmin groups. Udaysinh Peshwa and the Akhil Bharatiya Brahmin Mahasangh, among others, urged the Pune police to deny permission for the event. They disputed the historical account that the British Army had won the battle of Bhima Koregaon and asserted that it was not proper to celebrate the British victory over an Indian force. The labelling of the Parishad and Bhima-Koregaon commemoration as “anti-national” began right here. Eventually, permission was given, but with several caveats. This entry was posted on Thursday, June 14th, 2018 at 00:03	and is filed under Uncategorized. You can follow any responses to this entry through the RSS 2.0 feed. Both comments and pings are currently closed.